He was right. Today, 49% of the world’s population is connected online and an estimated 8.4 billion connected things are in use worldwide. The stickiness and value of a connected life will be far too strong for a significant number of people to have the will or means to disconnect. The Internet of Things (IoT) is in full flower. 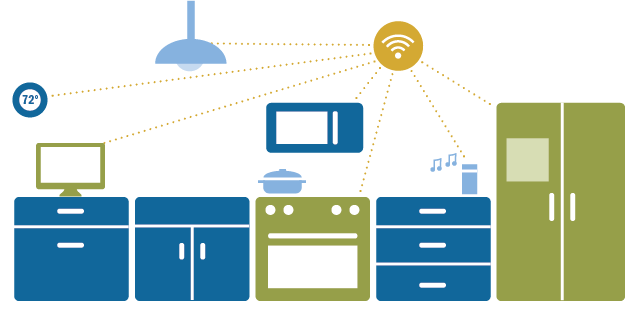 The expanding collection of connected things goes mostly unnoticed by the public – sensors, actuators and other items completing tasks behind the scenes in day-to-day operations of businesses and government, most of them abetted by machine-to-machine “computiction” – that is, artificial-intelligence-enhanced communication. The most public items in the burgeoning IoT are cars, voice-activated assistants, appliances and other home systems, physician-prescribed or recommended health-monitoring devices, road sensors, public-safety and security devices, smart meters and personal fitness and health trackers for people and animals – dogs, cats, horses, cows and more. And then there are emerging IoT products that show how the urge to create connectivity extends to such prosaic items as toothbrushes, dental floss, hairbrushes, pillows, egg trays, wine bottle sleeves, baby monitors and changing tables, silverware, umbrellas, all manner of toys and sporting goods and remote-controlled pet food dispensers, to name a few. The very connectedness of the IoT leaves it open to security and safety vulnerabilities. Every connected thing is susceptible to attack or misuse. In September 2016 at DEF CON, one of the world’s largest security conferences, 47 vulnerabilities affecting 23 IoT-enabled items (door locks, wheelchairs, thermostats and more) from 21 manufacturers were disclosed. Soon after, there was a massive distributed denial-of-service (DDoS) attack on Oct. 21, 2016, against Dyn, an internet performance management company. The attack was accomplished when tens of millions of IoT-connected devices like printers, DVRs, cable set-top boxes, webcams and baby monitors were used to launch the DDoS and block Dyn’s ability to connect internet users to the web addresses they hoped to access, such as Twitter, Amazon, PayPal, Spotify, Netflix, HBO, The Wall Street Journal and The New York Times. A simple software program called Mirai was used to create the botnet that initiated the attack. After the Dyn attack, a report in The New York Times called the IoT a “weapon of mass disruption.” While that assault amounted to nothing more than a short-lived slowdown of a large portion of the internet, it showed how vulnerable connected devices are to hacking and exploitation. In recent weeks, a ransomware attack named WannaCry affected computers in 150 countries, and its creators demanded payments from those whose computers were compromised before releasing their files. Experts pointed out how dramatically this attack highlighted the vulnerabilities of the IoT. Researchers have been showing how easy it is to hack cars, voting machines and power plants. They have demonstrated ransomware exploits against home thermostats and exposed vulnerabilities in implanted heart pacemakers. In one paper, “IoT Goes Nuclear,” analysts showed how a flaw in the design of smart lightbulbs could be used for a “bricking attack” that kills all of a city’s traffic lights. Within the past year Bryan Johnson (Kernal), Elon Musk (Neuralink) and Mark Zuckerberg (Facebook’s Building 8) have announced initiatives to create an effective consumer-grade brain-computer interface thus, of course, hacking a person’s brain could also be a future security issue. Connectivity has many exploitable flaws: Many respondents, including those arguing the case that more connectivity will unfold, outlined downsides to hyper-connectivity. They maintained that defects and vulnerabilities are a natural part of quickly evolving networks, and software and hardware and security responses are always a step behind. Many believe that ongoing attacks are inevitable in all networked digital systems, and there will be large-scale problems in coordinating various elements of the IoT to get them to work together. While these experts expect that living an IoT-dependent life will be scary at times and often frustrating, most do not expect this will be enough to deter most people from diving deeper into connectivity. Many participants in this canvassing wrote detailed elaborations explaining their positions. Some chose to have their names connected to their answers; others opted to respond anonymously. These findings do not represent all possible points of view, but they do reveal a wide range of striking observations. Respondents collectively articulated seven major themes that are introduced and explained below and expanded upon in sections that begin later in this report. The following section presents a brief overview of the most evident themes extracted from the written responses, including a small selection of representative quotes supporting each point. Some responses are lightly edited for style or due to length. We have a deep need and desire to connect. … I see no evidence for a reversal of that trend. 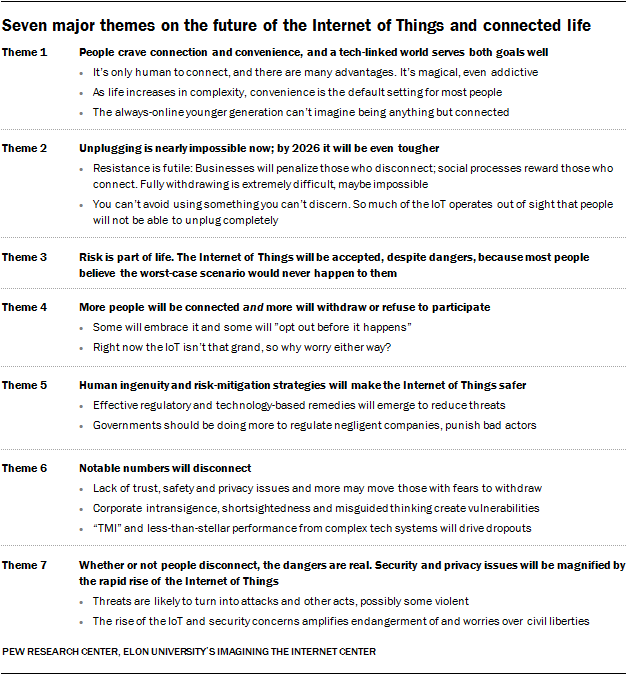 The vast majority of expert respondents to this research study, as well as to a previous study on attitudes about the future of the Internet of Things by Pew Research Center and Imagining the Internet, agree that the IoT will continue apace, expanding vastly in size and influence over the next decade. They say businesses expect to reap large dividends from the advancement of the IoT and that people are naturally driven to connect to other people, information and services. Further, they argue that society reaps benefits from connected infrastructure and objects – from transportation, communications and business and industrial systems to individual products and services. Additionally, as modern life becomes more complicated, these respondents argue that people count on convenience to conquer chaos and they enjoy experimenting with magical new tools. Their desire for new gadgetry often outweighs any perceived risks. The magical behaviors that the new devices will provide will be too strong for people to resist. There are few examples in human history of people making rational decisions about privacy or security. A number of respondents said they expect the younger generation, accustomed from the start to trust in technology with few doubts, is likely to adopt the IoT, warts and all. Jan Schaffer, executive director of J-Lab: The Institute for Interactive Journalism, said youth will stay connected because they are too invested in the IoT to leave it. “Young people will continue to deeply connect until they have assets and identities that they care about and don’t want to put at risk,” she wrote. To today’s 10-year-old the idea of a watch that can’t take basic health information is like a 20-year-old trying to understand what the hell a cassette tape is. A number of respondents observed that the usefulness and “stickiness” of IoT platforms and services plus the corporate imperative to strive for constantly rising profits will drive IoT decision-making, causing businesses to operate in such a fashion as to make it increasingly difficult if not impossible for people to choose to opt out and still access services and functions. There is no choice but to become ever more networked and connected: Capital will demand it. Respondents resoundingly agreed that people are already dependent upon this vastly growing network, as it enables so many systems and helps so many people in successfully getting through each day. The IoT becomes more complex, more important and more difficult to disconnect from every day. A significant number will have the illusion of being disconnected [when they actually are not]. Many of these respondents point out that optimism bias generally moves people to perceive a potential risk as highly unlikely to harm them. When people ask themselves, often subconsciously, “Do the benefits outweigh the risks?” the answer is generally, “Yes – go for it!” – especially when connection and convenience are the result. The majority in this canvassing predicts that the general public expects that any problems tied to their connectedness will fall primarily upon others, not themselves. Online security is, by and large, an illusion. And I think we all agree to the illusion together. A share of the experts in this canvassing think that the future will bring far greater connectivity for most users and that – at the same time – a notable number of people will cut back their ties to connected things or withdraw from that world. They also imagine scenarios where people try to modulate their level of connectivity, being embedded to some degree in the connected world and, to some degree, also withdrawing from it. Many will disconnect, but equally as many will double down. Right now the IoT isn’t that grand, so why worry either way? A share of respondents expressed a low level of confidence that the IoT or the security of the networks will advance much in the next decade. Those whose responses generally referred to consumer-oriented applications such as “smart-home” items tended to find them to be less than worthy of sacrifice of one’s privacy or safety. They don’t think IoT uptake will live up to expectations, but they generally are not considering larger systems in the IoT such as transportation, environmental services and finance. Many respondents expressed confidence in the evolution of methods by which outside regulators, as well as developers of the software, hardware and networks undergirding the IoT, will build in some method of dealing with constantly emerging security, safety and civil liberties issues. It’s an arms race, for sure, but I’m confident that we will evolve better security. Indeed, regulators have just started to consider recommendations in this fast-evolving setting, moving slowly and not forcefully. The Food and Drug Administration’s (FDA) guidance for management of cybersecurity in medical devices was issued as a draft in January 2016 but not officially released until a year later. The recommendations are nonbinding – more like suggestions. And when the Federal Trade Commission (FTC) announced in January 2017 an IoT “Challenge to Combat Security Vulnerabilities in Home Devices” some experts worried that the top prize for winning submissions was a modest $25,000. As citizens become more educated about the network and how things are connected, more pressure will rise to provide safe and secure spaces. Some 15% of the respondents in this canvassing expect that perceived and real vulnerabilities of the IoT will move people to disconnect. They noted the escalating security and privacy risks posed by connected devices and the complications that occur when fast-changing, fast-growing complex systems are built and networked. Many among this share of respondents seem to have little to no confidence that the builders of the IoT will make security, safety and individuals’ civil liberties their first priority because profit, power and efficiencies always come first, leaving far less investment in the crucial, difficult, expensive and perpetual work of minimizing threats. Expressions of concern, disappointment and resignation are evident in the responses from those who say it is likely there will be some who choose to disconnect in some manner from the IoT. Mistrust is the big factor in these answers, especially when it comes to other humans. Their worries are generally tied to 1) their expectation of harm from criminals and other bad actors; 2) their suspicions about the primary motivations behind the acts of the corporate and governmental bodies they must depend upon to operate these networks and 3) their lack of faith that people can get it all together to plan, regulate, build, monitor, update and maintain such complex systems. More, and more serious, data breaches are likely to push people away from the Internet of Things. There is a limit to the trust people put into their machines. Some respondents wrote that people might simply withdraw from connectivity because they are overwhelmed. Among the contributing factors would be information overload; poorly made or overly complex IoT tools and systems; products that do not perform well, lack support and/or are in constant need of updates and patches; and IoT products that are given to new owners without the manufacturer knowing of the switch. As a result, some of these respondents say, people will disconnect to a certain degree or never consciously connect. Many respondents to this canvassing said the dangers of the IoT are real and present a daunting challenge. They are certain that in the future there will be more attacks with more devastating results as billions more things and people become interconnected online and systems become more complex and difficult to manage. Many have deep concerns about the protection of civil liberties in a world in which so much granular data is continuously collected and databased, especially considering the fact that the “threat environment” created by this complex networking is high. As physical attacks become more public, people will understand the need to take greater responsibility for their own cybersecurity. Connected cities will track where and when people walk, initially to light their way, but eventually to monitor what they do and say. This section features responses by several of the many top analysts who participated in this canvassing. Following this wide-ranging set of comments, a much more expansive set of quotations directly tied the seven primary themes begins on page 40. Opting out is not viable: How does one ‘disconnect’ from a home, city, airport, health care? Judith Donath of Harvard University’s Berkman Klein Center for Internet & Society wrote, “People will move more deeply into connected life – and they also will be moved there whether they want to be or not. The connection of the physical world to information networks enables the collection of an unimaginably vast amount of data about each of us, making it possible to closely model how we think and to devise increasingly effective ways of influencing how we act and what we believe. Attaining this ability is extraordinarily valuable to anyone with something to sell or promote. The crucial key is getting people to provide the data, and it’s not surprising that we’re already seeing many once stand-alone objects (watches, heart rate monitors, thermostats, cameras, house keys and so on) turn into data-collecting network devices. My concern with the safety of things that are part of deeply connected world is not about its security and the dangers of being hacked (though those are real, and quite serious) but with the dangers that come with their intended uses: collecting a vast amount of intimate data about each person, while weaving themselves into everyday life as a source of great convenience and pampering.